Trainer Chad Brown confirmed Monday morning that Klaravich Stables and William Lawrence's Grade 1 Preakness winner Cloud Computing will enter the Grade 1, $1.25 million Travers Stakes presented by NYRA Bets, on Saturday, August 26 at Saratoga. By Maclean's Music, a son of multiple graded stakes winner Distorted Humor, Cloud Computing impressively won his debut by 1 ¾ lengths on February 11 at Aqueduct Racetrack. Second in the Grade 3 Gotham Stakes March 4 at Aqueduct, he went on to finish third in the Grade 2 Wood Memorial. Despite accumulating 40 points on the Kentucky Derby leaderboard, his connections decided to skip the race. Making his first Grade 1 start in the second leg of the Triple Crown and sent off at odds of 13-1, Cloud Computing upset Kentucky Derby winner Always Dreaming and outdueled Breeders' Cup Juvenile champion Classic Empire to upset the Preakness with Hall of Famer Javier Castellano aboard. Returning from his victory in the Preakness to run in the Grade 2 Jim Dandy, the traditional local prep for the Travers, July 29, Cloud Computing briefly put in a bid before weakening on the far turn to finish last as the 3-2 second choice in a field of five. Cloud Computing has breezed twice over Saratoga's main track since the race, most recently working five furlongs in 1:01.65 last Saturday with Castellano aboard. Brown said he exited the work in good order leaving the trainer confident to enter him in the Travers. Brown said Castellano will ride Cloud Computing in the Travers, a race he won for a record fifth time when Keen Ice upset Triple Crown champion American Pharoah in 2015. Castellano also won with Bernardini (2006), Afleet Express (2010), Stay Thirsty (2011) and V.E. Day (2014). With Always Dreaming and Todd Pletcher-trained stablemate Tapwrit, the Belmont Stakes winner, also expected to run, it marks the first time that the individual winners of all three Triple Crown races will meet in the Travers since 1982, when Runaway Groom upset Gato del Sol, Aloma's Ruler and Conquistador Cielo. 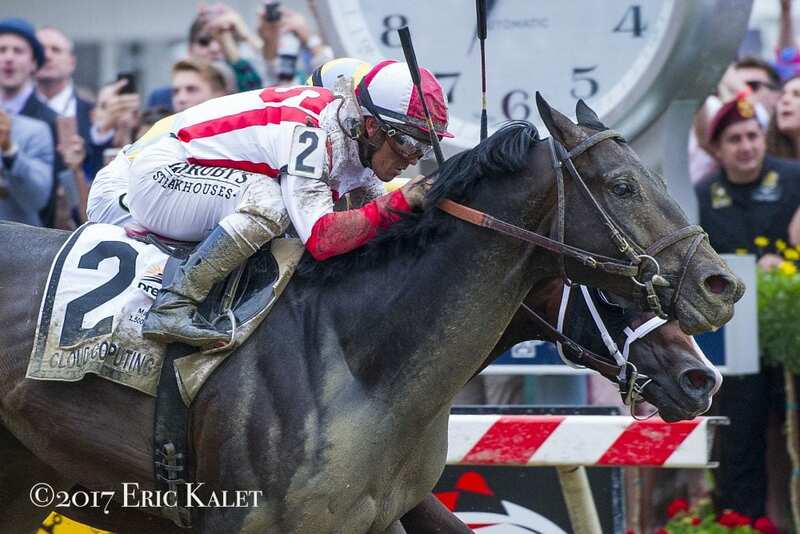 This entry was posted in NL List, Racing and tagged always dreaming, Chad Brown, cloud computing, Javier Castellano, jim dandy, Jim Dandy Stakes, maclean's music, mid-summer derby, preakness, Preakness Stakes, saratoga, Saratoga Race Course, tapwrit, travers, Travers Stakes by NYRA Press Office. Bookmark the permalink.